Seven rural school districts were closed Wednesday and around 18,600 utility customers were without power as the San Diego region remained under a red flag warning. The National Weather Service warning for the county mountains, valleys and coastal areas is in effect until 5 p.m. Wednesday. Winds were expected to blow east to northeast at between 25 to 35 mph with gusts near 60 mph possible near the coastal mountain slopes, according to the weather service. As of 11:50 p.m. Tuesday, around 18,600 San Diego Gas & Electric customers remained without power either because of planned safety outages or unplanned outages due to high winds. 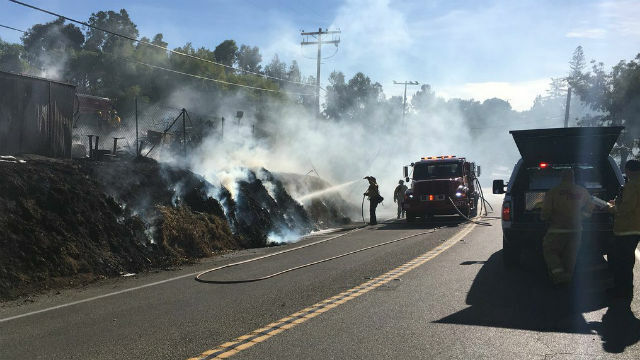 “At daylight, SDG&E crews and contract firefighters will resume patrols of our power lines to ensure they are safe and free of debris, before continuing with further power restoration,” the utility said on its website. Campuses closed for Wednesday because of the precautionary power-down were those in Jamul-Dulzura School District, Julian Union School District, Julian Union High School District, Mountain Empire Unified School District, Rancho Santa Fe School District, Spencer Valley School District and Valley Center-Pauma Unified School District. Del Lago Academy in the Escondido Union High School District and Solana Santa Fe School in the Solana Beach School District were also closed, according to the San Diego County Office of Education. In Los Angeles and Ventura counties, the Woolsey Fire has scorched 97,114 acres since it broke out Thursday and was 40 percent contained as of Wednesday morning. The fire has destroyed at least 453 structures and Cal Fire projected full containment of the blaze won’t come until Sunday. Areas of strong and gusty Santa Ana winds will continue into the afternoon, but the winds are expected to weaken Wednesday evening, weather service forecasters said.